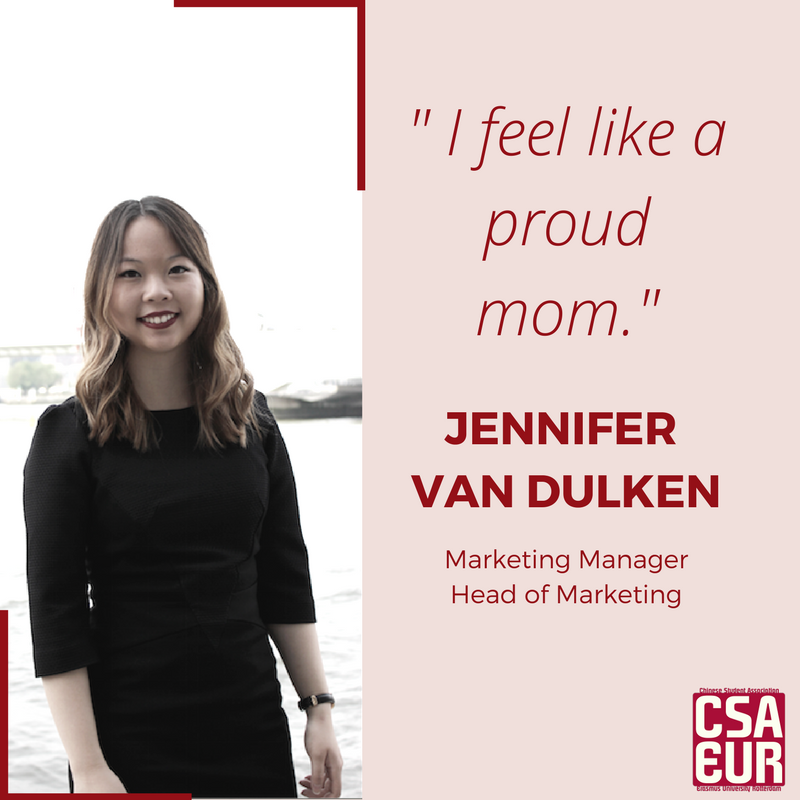 My name is Jennifer van Dulken and I am the Marketing Manager of CSA-E UR 2016/2017. My roots are from China, but I was raised in the Netherlands. 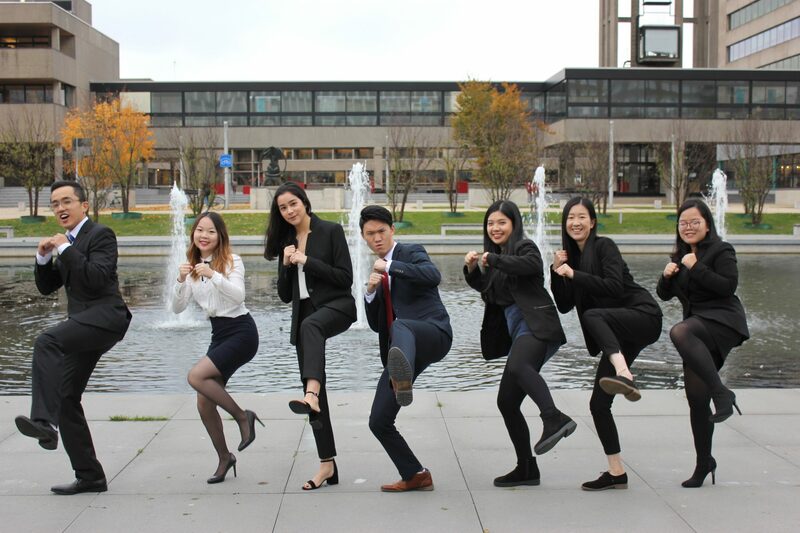 I am a second-year International Business Administration student at Erasmus University in Rotterdam. How did your CSA-EUR story begin? I started as a designer in the Marketing committee from November 2015 in my first year of university. A few months later, young 18-year-old me applied to become the next board. Why I chose for CSA-EUR? I agree with Michelle in this (read), the organization is small enough to be able to implement your creative ideas and large enough to have many responsibilities. During that time, I made a list of global ideas I had at the moment, I am happy to say now that the actions of the Marketing committee even go far beyond the list. My week starts on Sunday, I am brainstorming for the board recruitment website page and selecting the pictures from the CSA study trip that took place from 20 to 30 March. This week, I was still recovering from all the karaoke, desserts and stunning views that Beijing and Shanghai brought. Afterwards, I am making the agenda for the next Marketing meeting on Tuesday and checking the sign ups for the calligraphy workshop and sports day. Monday I have office hours from 13:00-16:00 in which I normally work on Marketing tasks such as Board recruitment and event planning, but also answer questions to (potential) members for example about Board recruitment! During these office hours, I helped with an intake test for language course students and catched up with Jia from the Education committee. When the office hours are over, old friends join me in the office and even bring me Vapiano delivery. In the evening we host our cultural event: the calligraphy workshop from 18:30-20:00. I am really glad to see a lot of happy faces joining the workshop. It was nice opportunity to chit chat with new people while Instagramming and Snapchatting the event. After the event, I had a board meeting because we had to meet again after the long study trip has passed. On Tuesday I have the meeting with the Marketing committee at the Student Hotel. After our meeting we celebrate our birthday day, basically all the birthdays of the committee in one evening. 🙂 We all drew lots and bought a suitable present for secret Santa. Afterwards we played ‘het dobbelspel’ for which we all bought random presents that everyone could win. Wednesday morning, I worked on board recruitment and planned social media for the upcoming month. In the afternoon, I attended the sports tournament, not as participant but as moral support. 🙂 I also recorded the highlights on social media (Snapchat and Instagram) and took some team pictures. After the event, we had a nice socializing dinner at Grand garden to review our gains and losses. To top it off, we needed some ice cream at MacDonald’s. Thursday I worked on marketing duties and Friday evening, I had my second board meeting this week! What did you learn during your Board year? During my board year I improved my interpersonal and communication skills and learned to lead a team creative and hardworking brains. Besides putting all Marketing skills into practise, my tasks mainly involved planning, coordinating and prioritizing different online and offline platforms while continuously improving the entire process. I tried to look what is best for the long term and focused on organizations’ strategy and identity what ultimately lead into the creation of a brand book. 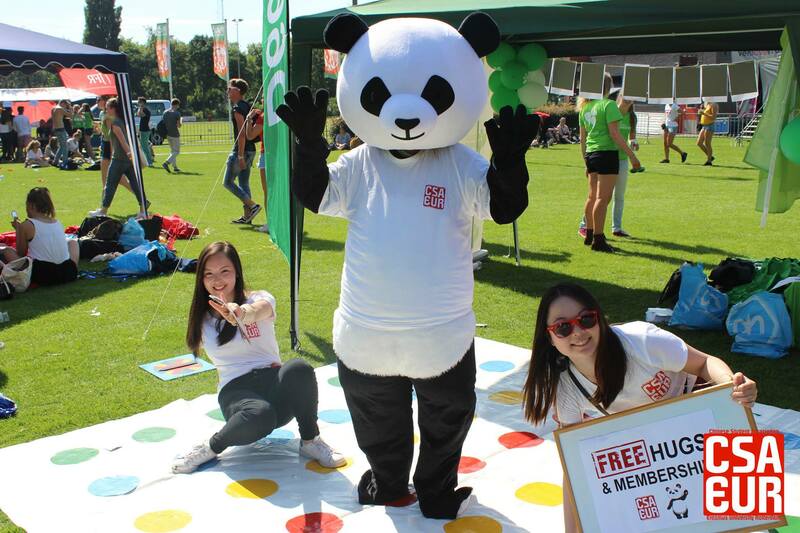 Furthermore, we introduced the CSA Panda as mascotte, who is a big social media hit! In this board year, I made a lot of fun memories, had a good dose of laughter but most importantly; shaped me how I am now and how I want to be. It definitely strengthened my my passion for Marketing. How is daily life as a Marketing Manager of CSA-EUR? What makes the position as Marketing Manager unique is that you are the ‘spin in het web’ (how we call it in Duch) as work tightly with other committees and almost involved in every process. Sometimes it is funny to hear new people say: Hey you’re the girl from CSA-EUR. This means as a board member, you are always representing CSA-EUR. 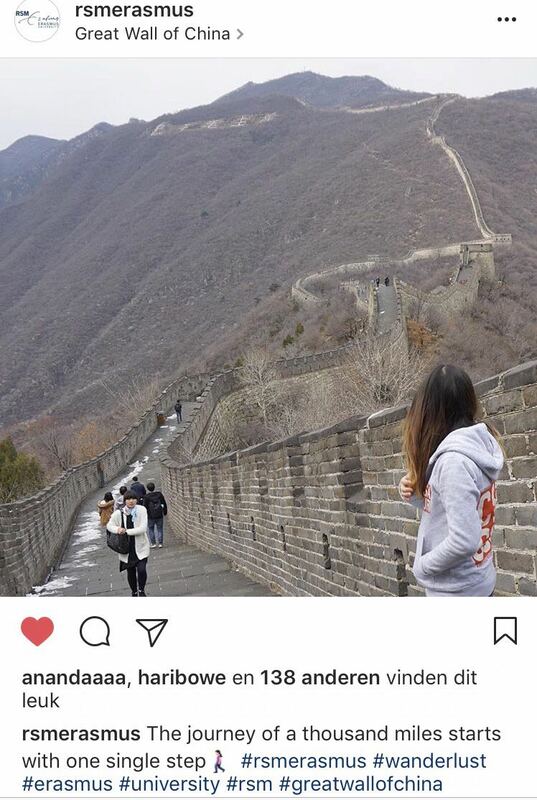 For example, I represented CSA-EUR as Instagrammer of the week of RSM during the Study trip to Beijing and Shanghai. Marketing is more than promoting events and creating promotional materials. As Head of the Marketing committee, you are always busy, in which tasks are never completely fulfilled. Actions speak louder than words, if you want something, you should go all in. I got in as rookie, but time went really fast and in a no time I turned into a mom. What achievements as Marketing Manager are you most proud of? 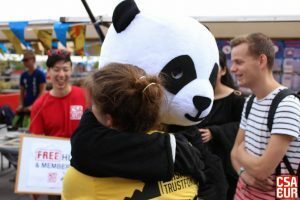 In the beginning of the year, we got a record number of fresh and enthusiastic members at the Eurekaweek. The days I will remember as sunny, Panda loving and me busy with breeding new herds of CSA representatives (CSlaves). After weeks of hard work (promotion!) we got 636 people attending to the Moon Festival! 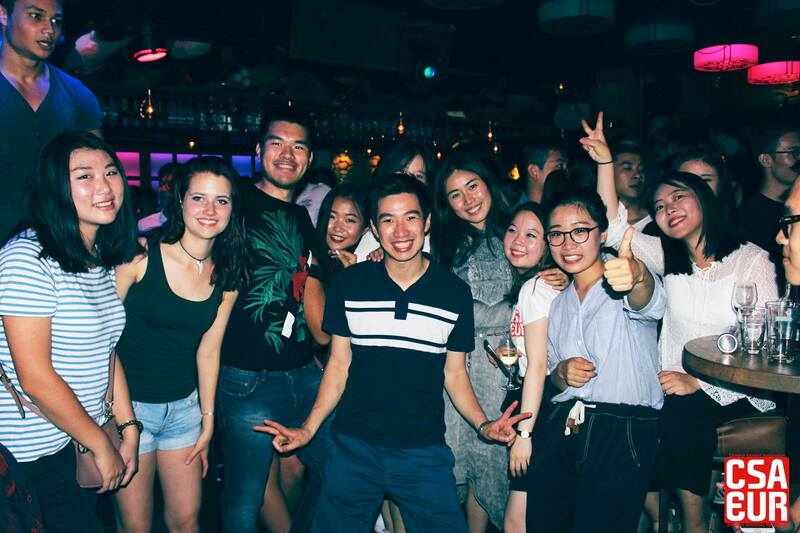 The Moon Festival growing exponentially, we keep it a challenge for upcoming years to not only meet, but also exceed expectations. Overall, marketing has set strong foundations for upcoming years, enhancing skills and results in almost all areas. This not only includes social media, website and design, but also analyzing data and ways of promoting. This year we focused a lot on general branding, documentation, internal communication, design standardization and more concrete promotion plans. Regarding the website, we had several brainstorm times about how to improve current website in areas such as SEO, speed and functionality. Next to that, for social media and the newsletter we increased consistency, started with analysing the traffic and imp lementing new ideas! I feel like a proud mom that has not fulfilled her duty yet, but feels more than honored to feed an example-worthy team who attributed significantly to the growth of CSA-EUR. What are your personal and organizational aspirations? I hope CSA-EUR will be filled with hardworking and inspiring people who go the extra mile to grow the association and can balance the real job with fun and passion. My next steps will be putting everything I learnt into practise but then during an internship in a more business environment. My ultimate goal is to form a strong bridge between China and Netherlands, in which CSA-EUR helped me a step closer to achieve it. 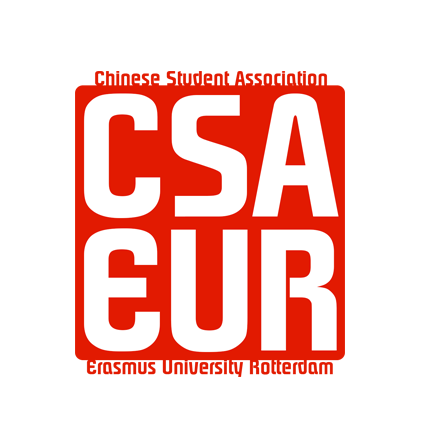 Is CSA-EUR board the destination of your next adventure? Reach out to us via recruitment@csa-eur.nl via and you have made your first step successfully! More information about Board Recruitment 2017/2018 and apply HERE. The deadline is Tuesday, 2nd of May 23:59!